I am going to leave apart the plug in Atari joysticks, these things are everywhere and not vintage. Here is what you can get today on CL. Atari 5200 , 8 games, no controllers $55 (ok) Old school gaming system. Missing controllers. Comes with games pictured. Well kept, in original box with manual. Atari C380 video Pinball $15 (ok) Vintage Atari C380 Video Pinball. Unit is in great condition. All knobs and buttons function perfectly. Runs on 6 C size batteries. A prime example of a hard to find Atari classic. here is an extract from Pong Story about this machine: " In 1977, a new type of ball and paddle system was launched: Video Pinball. This game also existed in the arcade under the same name, hence the home versions sold by Atari (Video Pinball, model C-380) and Sears (Pinball Breakaway, model 99713). These two systems were designed around a more advanced chip than the PONG-in-a-chip devices, possibly a microcontroller (believed, since the system also contains a small RAM chip which role is unknown, but believed to be for the display and/or score storage). The microcontroller is referred as C011500-1, although the system uses another Atari chip referenced C011512-05. The games played are based around the pinball and breakout principles. Depending on the game selected, the ball bounces on two bumpers (pinball games), or on a pad that moves horizontally (pinpaddle games), or just like in breakout." 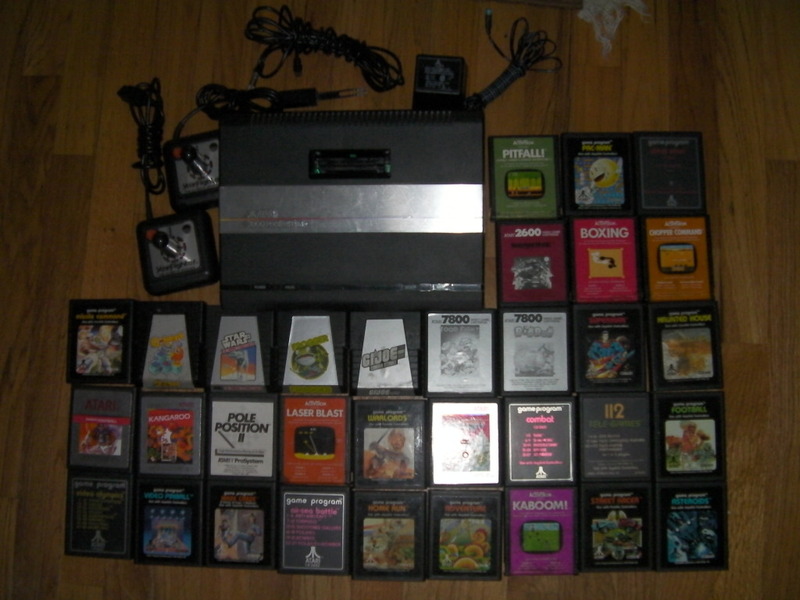 Atari2600 and Atari 5200, with games $150 (ouch) I have a very old set here. I have an Atari CX-2600 Video Gaming System and an Atari 5200 game system. I discovered it in my parents place while cleaning it out, but I do remember both working just fine last we had them hooked up. Obviously it has the old hooks ups so you will need an older TV or knowledge of how to bypass this in order to use it. The 2600 comes with 2 joysticks and 2 wheel turners. The 5200 has 2 controllers. Atari $150 (ha) Atari comes with two games and one controller. has been sitting in storage for over a year. needs power supply cord. Atari 2600 and 20 games $45 (good) This is the original antique... not a knockoff! Comes with paddles and joysticks.